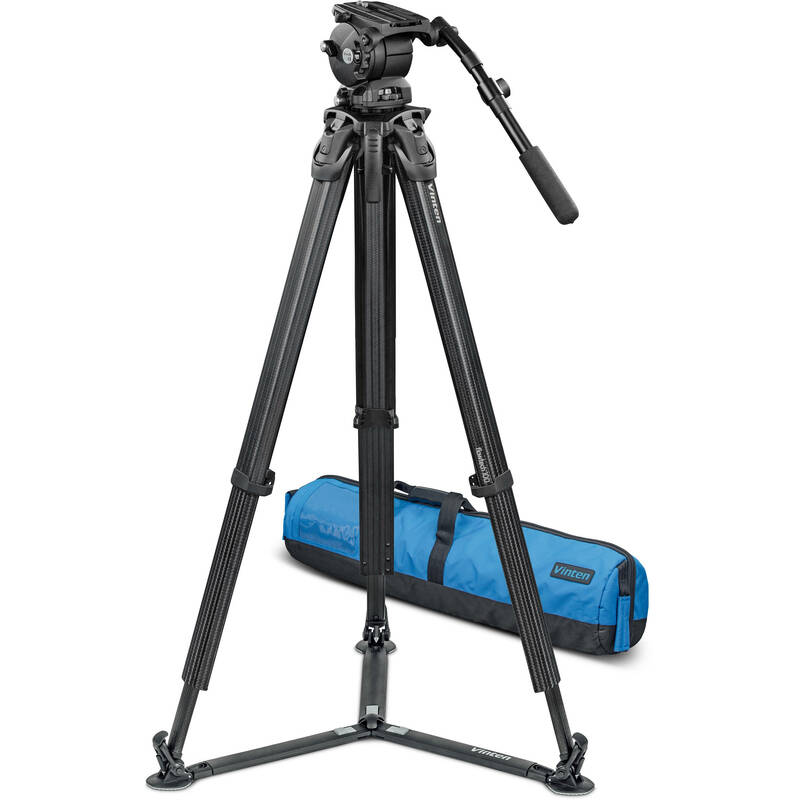 This Vinten System Vision 10AS with flowtech 100 Carbon Fiber Tripod, Ground Spreader & Case supports cameras and accessories weighing up to 37.5 pounds and is well suited for medium to large camcorders. The 10AS head features a 100mm bowl, adjustable pan bar, a sliding balance plate to balance your camera, and variable counterbalance adjustment, has variable tilt drag, and weighs a total of 15.9 lb. The head also features a tilt range of -90 to +90°. The included flowtech 100 carbon fiber tripod is lightweight, supports a 100mm bowl, and comes with a ground spreader. The tripod comes with removable rubber boots that can go over the spikes and connect the legs to the spreader. The two-stage legs have three locking points and can be adjusted individually when the spreader is removed. The tripod supports up to 66 lb, which can easily handle the weight of the fluid head as well as your camera and accessories. Additionally, each leg features a magnetic locking system strong enough to hold them together during transport, but gives enough to easily release the legs when you want to set them up. Use the included padded carry bag for storing or transporting the head and legs. The Vinten V4046-0001 Vision 10AS is a modern fluid head for shoulder-mount camcorders. It supports cameras and accessories from 14.3 to 37.5 pounds. This 100mm ball base fluid head offers illuminated level, a sideload system for attachment and LF drag control for a professional Vinten feel. The Vision 10AS offers a modern black color for those who want to change from Vinten's traditional white equipment. Perfect balance can be achieved with the 10AS because of an infinitely adjustable counterbalance. The blue illuminated bubble level is asthetically pleasing and easy to see in many lighting situations. LF Drag controls are numerically calibrated and feature the smooth, professional feel Vinten users come to expect. The Vinten flowtech 100 Carbon Fiber Tripod with Ground Spreader eschews the common single or double carbon fiber tube design; instead it has redesigned the shape of the legs for improved torsional strength. The legs weigh just over 7.1 pounds, yet they can support a payload of up to 66 pounds, and extend from a minimum height of 16.9" to a maximum height of 62.6" when using the included removable ground spreader. Each leg features a single clamping lever that locks and unlocks the sections. Each leg extends or retracts independently from the other two, and when it is detached from the spreader each leg can pivot without affecting the other legs. This is especially useful when working on rough or uneven terrain. You can remove the spreader completely and lock each leg in one of three positions, so you can work without a spreader if you wish. This enables you to spread the legs extremely wide for low shots while the tripod legs maintain their torsional stability. The dual spikes at the end of each leg provide extra grip when working on softer ground, and you can snap on the included rubber feet onto the dual spikes for better grip when working on hard or delicate surfaces. Included with the legs are an attachment mount and a carry handle that mount on the side of the bowl using the 3/8"-16 threaded mounting holes. Dual-stage, carbon fiber, 100mm bowl tripod. Three 3/8"-16 accessory mounting holes are integrated into the outside of the 100mm bowl. The legs by themselves weigh only 7.1 pounds but support up to 66 pounds. The design and construction of the legs provide tremendous torsional stability. In other words, the legs resist twisting when you pan the tripod head. When using the ground spreader, you can use the included rubber feet to protect delicate surfaces from the tripod's foot spikes. Each leg features a single clamping lever lock design at the top of the leg, near the 100mm bowl. This allows you to loosen all three leg sections from a single location, saving you time while reducing the wear and tear on your body as you don't have to bend down to loosen a lock at the bottom to lower or raise the legs. The legs incorporate a locking mechanism that enables the legs to move freely for working with a spreader, or to lock at one of three angles when working without a spreader. With the spreader, the height range is 16.9 to 62.6". However, if you remove the ground spreader and utilize the built-in locking mechanism, the usable height range is 10.2 to 60.2". When closing the legs, there is room for the ground spreader to be folded up while remaining attached. The legs feature a magnetic locking system strong enough to hold them together during transport, but it also allows you to easily release the legs when you want to set them up. The Vinten Soft Tripod Case is padded and designed to carry a Vinten Vision 3, 6, 8, or 11 (2-Stage) Tripod System. It has interior and exterior pockets for documents or accessories, multiple handles, and a padded, adjustable shoulder strap. Box Dimensions (LxWxH) 17.9 x 10.2 x 8.1"
Box Dimensions (LxWxH) 34.0 x 13.0 x 2.0"